"They have no idea I'm here," says GamesRadar's Lucas Sullivan as he sneaks up behind two enemy gods in my lane. I'm casually killing minions in front of my tower in Conquest mode, Smite's take on the 5v5 Multiplayer Online Battle Arena codified by Dota and League of Legends. On a strategic level, Smite plays almost identically to League, but it tucks the camera in close behind the back of my character—a god pulled from the pages of Greek or Hindu or Egyptian mythology—and feels more like a third-person action game as I cast magical abilities with the keyboard and sling attacks with the left mouse button. "They have no idea I'm here," Lucas repeats, giddy, as he moves into attack range behind our opponents, kills one with a flurry of special abilities, and is on top of the next before I can even move in to help. Two free kills. An easy gank, in MOBA terms. They never saw Lucas coming because they never turned around. And if you never turn around in Smite, you're probably going to die. I spent somewhere north of 1000 hours playing League of Legends before giving it up. I relapsed a couple times like any good addict, but I've been clean for the better part of a year now. Smite manages to scratch the same competitive itch as League while simultaneously feeling like a very different game. I'm getting that tug of addiction again without the familiar feeling that I've done it all a thousand times before. That said, Smite does slavishly adhere to the MOBA template: Two teams of five players face off on a map built with three lanes, separated by an intertwining "jungle" filled with agnostic AI enemies that grant XP and buffs to speed, magic, or damage. Minions march inexorably down each lane. Players kill them to earn gold, buy items, and level up. Teams begin to group up and fight together, relying on characters of different roles to perform specific functions. Tanks like Hades and Athena stun and taunt the enemy team. Carries like Neith and Anhur pump out consistent damage. Assassins like Loki and Bakasura lunge in to get kills. The team that wins fights pushes up the lanes, destroys towers, and eventually takes down the enemy Titan for the win. A quick match will be over in 25 minutes. A long one will drag on for an hour. Smite's matches trend towards the shorter end of that spectrum, which I find welcome in a MOBA: they're long enough to invest in but short enough to avoid being exhausting. Smite's third-person camera sends ripples of change through the MOBA infrastructure. Most attacks in the game are "skillshots," meaning they have to be judged, aimed, and timed for range and speed. Judging distance in three dimensions is far harder than it is with a top-down camera. In League of Legends, many champions can land basic attacks and devastating abilities with a simple click. They can't miss. In Smite, almost everything can miss. In a match I played as Vulcan, the Roman Smith of the Gods, I had Egyptian goddess Neith dead to rights. She was down to a sliver of health when I launched my Ultimate ability, a heavily damaging rocket that drops an AOE damage circle as wide as a lane. There was no way she could flee the circle in time. But at the last second, she used Back Flip—not to jump out of the circle, but to be up in the air when the missiles landed. She got away. Aiming and landing attacks is instantly challenging and gratifying. Each attack landed, whether it's Egyptian god Anhur's javelins or Poseidon's blasts of water, feels like a minor victory. Each attack anticipated and dodged without peripheral vision feels like a major accomplishment. Smite's combat is so fun I ended up spending more time playing its action-focused Arena mode than the MOBA Conquest. Arena is essentially team deathmatch with accelerated leveling—if Conquest is Smite's version of the gods participating in a noble game of grand strategy, Arena is its mythologically jumbled barroom brawl. Each kill peels points away from the enemy team's score, and the whole thing is over inside of 20 minutes. Arena's a great way to test out a new god and learn how their abilities work, but it also proves how much work the action half of this action-MOBA hybrid does to keep Smite engaging. Smite also has an equivalent of the chaotic ARAM (All Random All Mid), a popular mode born out of custom MOBA matches that eventually got its own matchmaking queue in League of Legends. And Smite has a goofy daily mode that's good for a laugh, such as a 5v5 match of everyone playing Greek god Chronos. Chronos' ultimate ability lets him turn back time to reverse all damage he took for the past eight seconds. 10 people doing that simultaneously is a nightmare scenario that would send Doc Brown into a space-time continuum fit. ARAM is the go-to not-so-serious mode in League of Legends. It's like a sloppy real-time strategy match. Smite's ARAM feels just as throwaway, but Arena's combat focus gels perfectly with the third-person camera. Arena feels more like a simplified MMO PvP mode. It's more fun, makes better use of its gods' variety of skills, and it's still easy to shake off a loss when a match lasts 15 minutes. Despite the demand for precise skillshots, Smite is more approachable than League of Legends or Dota 2. Fights are frantic, but most gods have generous escape abilities to leap out of combat or chase a fleeing opponent. Hades, one of my favorite gods, has an ability that drops him underground and warps him to a target location where he pops back up and deals damage to any enemy nearby. Early game, while I'm laning, I'll use the ability to close in on squishy gods, then throw out Hades' silence ability and AOE attack to do some damage. Late game, it's a great way to initiate team fights. Because Hades is a tank, I usually live long enough to survive until the ability's cooldown is up, and if I'm hurt, I'll pop Death From Below again to flee from the battle. Hi-Rez smartly targeted some of the MOBA genre's lingering ambiguity and stripped it out to soften the learning curve. I picture their designers sitting around a table having a eureka moment: "What if we just made everything a little bit easier to understand without ditching the complexity?" Experience and gold are shared within a short range, so getting the last hit on a minion to kill it isn't a critical part of the laning phase. Last hits still net more gold. Jungle minions drop their buffs onto the ground so any teammate can pick them up, instead of granting it to the last hitter. One of the side lanes, traditionally reserved for a powerful solo champion, is noticeably shorter than the opposite side, subtly beckoning a solo laner while also making that lane slightly safer from ganks. A robust voice command system adapted from Tribes: Ascend simplifies callouts like "missing in action," "retreat," "defend right lane," and so on. In my time playing Smite, players have regularly used this system to communicate, which makes teamwork with strangers surprisingly effective. General items, activatable items, and consumables are separated out and serve different functions. Active items that refill mana or place wards every 90 seconds save money and encourage staying in lanes longer. 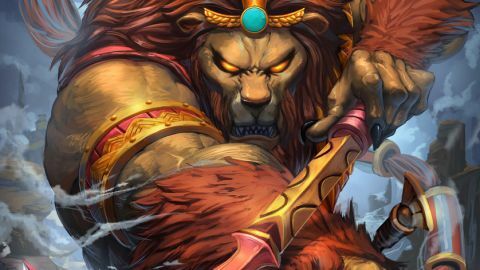 Smite even welcomes newcomers with tools that circumvent the challenge of learning item builds and ability orders. Auto-buy and auto-level are enabled by default, spending gold and experience on a set path for each champion. I turned the systems off to force myself to learn my way around the item store and each god's abilities, but they're not just tools for beginners. The auto-buy paths for each god can be customized in Smite's launcher to adhere to whatever order you prefer. Smite's free-to-play economy is, likewise, refreshingly streamlined. There are no rune pages or masteries, nothing to spend money on that affects gameplay balance. Real money and in-game currency are only used to buy new gods, skins, and voice packs. And if you don't want to grind out games to earn new gods, you don't have to. A $30 god pack buys every god in the game—there are 51 as of this writing—and every god Hi-Rez ever releases in the future. In League of Legends, new champions cost about $7.50 a pop. All of Smite's gods cost 200 gems, or $4. $30 for the whole pantheon, present and future, is an absurdly good deal for a free-to-play game. I love that I don't have to spend dozens of hours—or dozens of dollars—earning in-game currency to spend on items that incrementally buff my characters. It's rare for a free-to-play game to truly put balance ahead of profit. Smite does. Still, the meta leveling progression is missing something. Leveling an account to 30 simply grants access to ranked league matches, with no unlocks or rewards along the way. Why not let me jump into ranked play earlier, if I want to? The leveling system feels like a leftover F2P element that doesn't fulfill its original purpose. By level 10, I felt like I knew Smite well enough to dip my toes into a ranked match, even if I would've been stuck in the lowly bronze league. The 30-level arc isn't there to stop me from having fun, though. It's to stop me from ruining other people's fun in ranked play—to ensure I'm not going cluelessly die over and over again like a chump and waste 40 minutes of my team's time. Hi-Rez could've come up with a better way to gate access to ranked play, but the 30 level system does, at least, preserve the competitive balance of ranked games. In the dozens of hours of Smite I've played, only other human beings could sour the fun. You know these people: the ones who drag down your team but blame everyone else. The ones who ignore pleas for teamwork. The ones who leave mid-match, crippling your team in 4v5 fights. The ones who claim "mid" or "solo lane" because that's the most fun for them. They're playing Smite, too. But there don't seem to be as many of them. Perhaps thanks to the voice command system, Smite has one of the least vitriolic competitive communities I've played with. MOBAs are vastly complex games that demand skill and study and patience. Mechanical execution will win fights, but strategy and coordination win games. Smite demonstrates a rare willingness to teach, with tools and genre tweaks that show how thoughtful design can cut through the barrier that makes MOBAs so intimidating to learn. The high skill cap is still there if you want to reach for it. It may not sit on the tallest, Misty Mountainest peak alongside Dota 2, but Smite's skill ceiling balances the approachability of action RPG combat with deep MOBA strategy. The gods are surprisingly diverse in abilities and playstyles, and though balance is always a moving target, almost every god shows up regularly in online play and is capable of deicide in the right hands. Perhaps the strongest endorsement I can give Smite is that I keep trying out new gods instead of sticking with one that I can play reliably. In League of Legends, I spent a long, long time mastering one champion that I loved. In Smite, I'm finding something to like in almost every god I play. Learning dozens of movesets feels like an excuse to keep playing rather than an intimidating knowledge gap to struggle against. I don't think I've truly mastered any of the gods yet, but I have, at least, learned to watch my back.